This rare photo from the Reeves family collection shows Jim on his first USO tour in 1954. He was part of a contingent of artists headed by actor Forest Tucker which played 23 shows in 18 days at military bases in Germany, France, the Azores and Newfoundland. Jim spent Christmas day with GIs at Orly Field near Paris, and New Year's Day in Stuttgart. 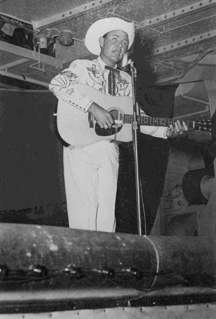 Here he performs on the U.S.S. Lake Champlain in the Mediterranean off Marseille, France. (U.S. Navy photo).